Happy Friday! I hope you've had a great week! We are headed to Oak Island this afternoon for a weekend at the beach and I'm so excited! I can't wait to relax on the beach all day tomorrow and go to our favorite restaurant (Provision Co.). You can read about our last trip to the Southport and Oak Island area in this blog post! 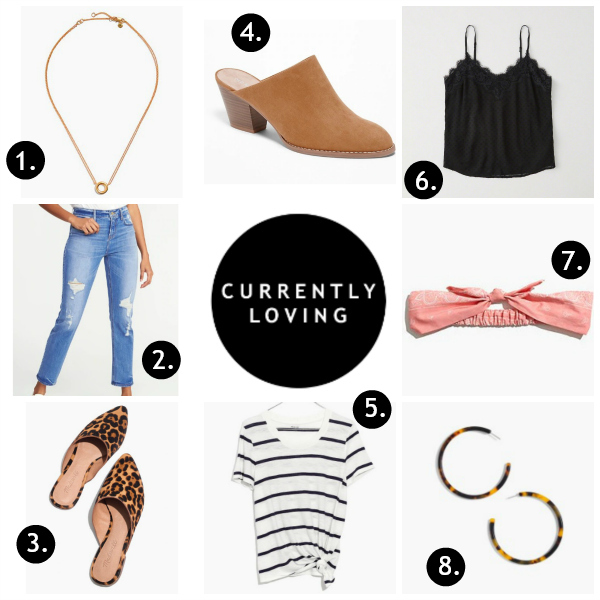 Today, I'm sharing my weekly roundup of what I'm currently loving. When August comes around, what I'm shopping for starts to change. I'm no longer buying pieces that are exclusive for summer but instead, I like to purchases items that I can wear now while it's still warm and later when the temperatures start to cool off. I absolutely love transitional style! 1. N E C K L A C E | I absolutely love this simple style of this necklace and it could be worn with any outfit. Sometimes simple is best! 2. J E A N S | I own this style of jeans in four different washes. Yes, I love them that much! The rise is perfect and I'm a big fan of the straight style. I find the fit to be true to size. 3. L E O P A R D M U L E S | I have already ordered this gorgeous mules because I wore my tan leather ones by this brand so much last fall. I'm so excited for the leopard print. I size up a half size in these for the best fit. 4. M U L E B O O T I E S | I'm obviously loving mules! This budget friendly pair would be super cute with a dress now and jeans later. I love this style! 5. H E A D B A N D | I'm planning to carry by headbands and scarves into fall because I love the fun pop of color they had to basic outfits plus they are super functional as well! 6. C A M I | You can't go wrong with a black lace cami! This is such a great piece to wear now on it's own and later as a layering piece under a cardigan or denim jacket. 7. K N O T T E D T E E | You can never have too many striped tees! At least I don't think so. I love the adorable knotted detail on this one by my favorite brand. 8. E A R R I N G S | This tortoise hoops are so fun! I have always been a fan of tortoise and I am loving hoop earrings right now. I need to add these to my cart!